Recently, the California Department of Pesticide Regulation (CDPR) released its 2017 Pesticide Residues in Fresh Produce report. During its 2017 survey, CDPR found 96 percent of all samples had no detectable pesticide residues or residues were below levels allowed by the Environmental Protection Agency (EPA). The CDPR report complements the recently released United States Department of Agriculture’s (USDA) Pesticide Data Program results which found 99% percent of the foods sampled had no detectable residues or residues were well below EPA tolerances. The Federal Food and Drug Administration (FDA) also conducts pesticide residue sampling. FDA results mirrored the USDA’s. The FDA, USDA and CDPR reports all concluded that these residue results should provide consumers with confidence about the safety of eating fruits and vegetables. All three government reports garnered very little attention. However, this is reassuring food safety information that consumers should know. Instead, they often receive inaccurate assertions about residues carried by activist groups promoting one production method over another. The Alliance for Food and Farming supports consumer choice by providing science-based facts to help them make the right shopping decisions for themselves and their families. Whether they choose organic or conventional produce, consumers should know that when it comes to residues, both production methods yield safe produce that can be eaten with confidence. CDFA announced recently the creation of a new unit within its Inspection Services Division which will be responsible for educating California produce farmers about new Produce Safety Rule regulations under the Food Safety Modernization Act and for conducting routine on-farm inspections of California produce farms to verify they are in compliance. According to a CDFA press release, this new unit, called the Produce Safety Program, will spend 2018 educating California’s produce industry about the requirements of the Produce Safety Rule. On-farm inspections will not take place until 2019. At that time, the Produce Safety Program will begin conducting inspections of California produce farms on behalf of the U.S. Food and Drug Administration. Produce Safety Program inspectors are employees of CDFA, but are credentialed by the FDA and thus have special training and education. The CDFA is working collaboratively with FDA to implement Produce Safety Rule regulations, as are State Departments of Agriculture throughout the country. The new requirements of the Produce Safety Rule became mandatory throughout the nation on January 26th for farms designated as “large” which means they have $500,000 or more in annual sales. Most farms who grow leafy greens under the LGMA would be characterized as large under this definition. Smaller farms will be phased in over the next few years. In total, it’s estimated there are some 20,000 fruit, vegetable and nut farms in California that will fall under the Produce Safety Rule. CDFA emphasizes it will be a big job and has stated it will need to work closely with the California produce industry to achieve its goal of 100% compliance with the Produce Safety Rule on California Farms. The LGMA has been working closely with both the U.S. FDA and CDFA to ensure our food safety program works in conjunction with efforts to enforce the Produce Safety Rule. Last August, the LGMA Board approved revised metrics so that our required food safety practices are in full compliance with the Produce Safety Rule. We have since received confirmation from FDA that these revised metrics do indeed align with the requirements of the new regulations. In many cases, the LGMA metrics continue to go beyond what is required by FDA. Working from the revised metrics, CDFA will begin using an updated audit checklist that is Produce Safety Rule-compliant checklist for all LGMA government audits beginning April 1. Because of these actions, CDFA has informed us that California farms who grow leafy greens for certified LGMA members will be considered compliant with the Produce Safety Rule. More details will be coming as we get closer to April 1, when the LGMA’s new compliance year begins. In the meantime, we want LGMA members to know that FDA will be able to validate compliance with the Produce Safety Rule on farms who grow your leafy greens without the need for additional and duplicative inspections when Produce Safety Program begins inspecting farms in 2019. CDFA has recognized the efforts of the LGMA to establish a culture of food safety on the farm and they acknowledge that mandatory government audits are already taking place on California leafy greens farms who operate under the LGMA. As a reminder, under the LGMA program, every handler-member continues to be audited by the government an average of five times over the course of the year—with one unannounced audit—and every farmer is audited at least once per year. This recognition by government agencies at FDA and CDFA is welcome news to the LGMA, our members and produce buyers. The LGMA is pleased to see the addition of this new unit at CDFA to provide government inspections throughout California’s produce industry. And we look forward to additional oversight provided by the Produce Safety Program to further validate that leafy greens are being farmed safely. Natural, unsalted almonds are a tasty and nutritious snack with plenty of health benefits. Loaded with minerals, they are also among the healthiest of tree nuts. Just a handful of nutrient-rich almonds a day helps promote heart health and prevent weight gain, and it may even help fight diseases like diabetes and Alzheimer’s. Eating about 23 almonds a day is an easy way to incorporate many crucial nutrients into your diet. Almonds are rich in vitamin E, calcium, magnesium, minerals and potassium. Additionally, almonds are a significant source of protein and fiber, while being naturally low in sugar. One 23-almond serving packs 13 grams of healthy unsaturated fats, 1 gram of saturated fat and no cholesterol or salt. Of all tree nuts, almonds rank highest in protein, fiber, calcium, vitamin E, riboflavin and niacin content by weight. There are 160 calories in 23 almonds. While many of these calories come from fat, it is primarily the healthy unsaturated fats and not the unhealthy saturated kind. According to the FDA, eating 1.5 ounces a day of most nuts, like almonds, may reduce the risk of heart disease. Many of the nutrients in almonds help contribute to increased heart health. For one, almonds are rich in magnesium, which is critical in preventing heart attacks and hypertension. Several clinical studies have also shown almonds can be effective in reducing bad cholesterol and preserving healthy cholesterol, which plays a major role in heart health. Nuts, like almonds, are also beneficial for maintaining a healthy weight. The fiber, protein and fat content of almonds means it only takes a handful to keep you feeling full and satisfied so you won’t have the urge to overeat. According to “Fitness” magazine, the magnesium in almonds helps regulate blood sugar, which is key in reducing food cravings. Almonds may even be able to block the body’s absorption of calories, making them the ultimate weight-loss-friendly snack. Because almonds are naturally high in calories, it’s important to limit your serving size to the recommended 1 ounce, or 23 nuts. 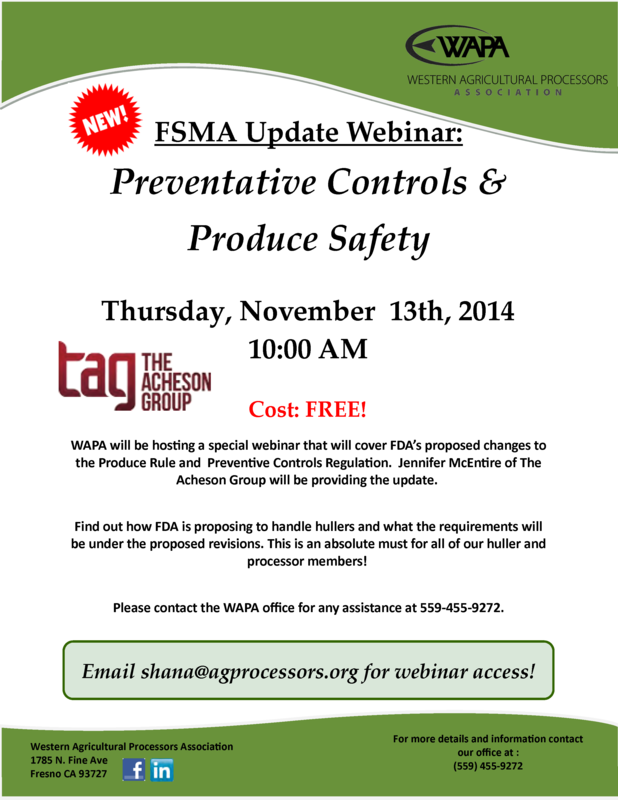 The Western Agricultural Processors Association (WAPA) will be hosting a very special webinar on Thursday, November 13, covering the U.S. Food and Drug Administration’s (FDA) proposed changes to the Produce Rule and Preventive Controls Regulation of the Food Safety Modernization Act (FSMA). Jennifer McEntire of The Acheson Group will be providing the update. Find out how the FDA is proposing to handle hullers and what the requirements will be under these revisions. This free webinar is an absolute must for all huller and processor members. For more information about WAPA, click on the link http://www.agprocessors.org. Register here for the webinar. 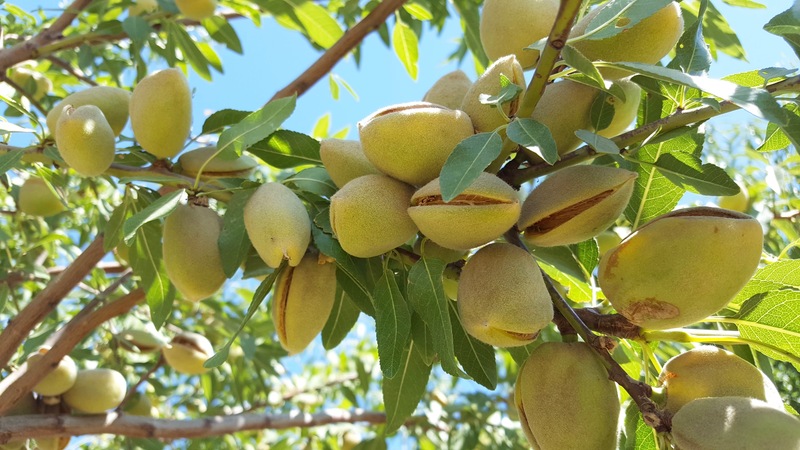 The Western Agricultural Processors Association (WAPA) represents facilities involved in the processing of almonds, pecans, pistachios and walnuts. Regular WAPA memberships are limited to almond hullers or processors, pecan and pistachio processors, and walnut dehydrators and processors. Associate memberships include any individual or business entity which is not engaged in agricultural processing, but which provides products or services directly related to the agricultural processing industry, such as commodity brokers, accounting firms, and insurance brokers.